Making art can help young people deal with the challenges of violence and poverty, and there are programs that focus on that. What poet Robyn Miller has in mind with the project she calls “Baltimorphus” is different. Miller’s mission marries the creative with the practical: She hopes to encourage the budding writers, painters and musicians she encounters to view their talents as career opportunities. In urban neighborhoods where good jobs are scarce, it can be a compelling message. “I want kids to think of their art that this is what they do – they can sell their work, and there’s different ways to do this,” Miller says. A Northern Virginia native, Miller lived in the Boston area for about 30 years and moved to Baltimore last year, drawn in part by the growing creative community here. 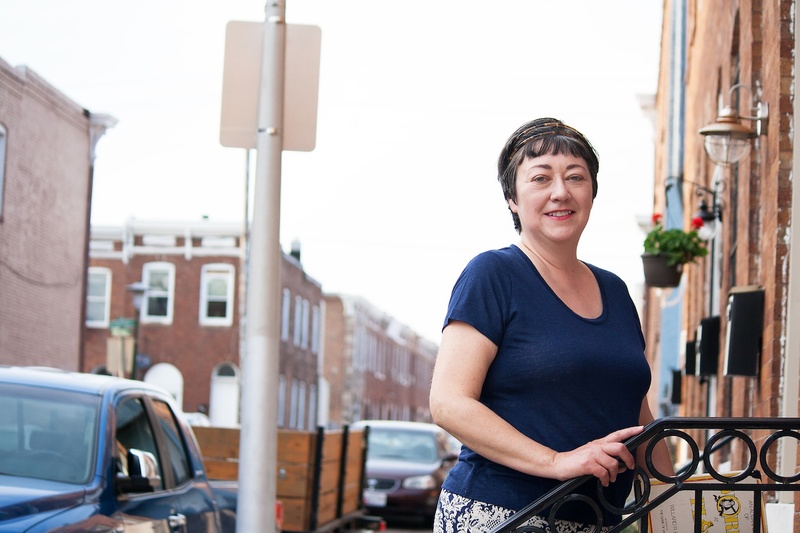 She quickly became involved in local issues in her Patterson Park neighborhood and, like many others, was shocked when a woman was killed in her home in nearby Highlandtown in January. One of the teens accused of the crime, she said, had been identified as gifted. “Safety is something everyone’s concerned with. We should also be concerned with kids having some direction, something to do,” Miller says. Miller envisions having kids come to after-school workshops in a local library or at the Creative Alliance at the Patterson. Because her concept is career-focused, it’s important to her that the participants produce work that can be sold or shown for money. That could take the form of a book or a magazine, maybe both. Another goal is staging a show for which tickets will be sold, possibly at the Patterson. Miller plans to ask the youths for examples of songs they enjoy, to get the creative juices flowing. She will prompt them with fun writing activities like composing haiku or creating an acrostic poem where each line of the poem starts with a letter of the student’s name. One idea that excites her is taking a classic, out-of-print book of illustrated poems by Henry Clayton Hopkins of Baltimore and having the kids update the work with their own words. Although Miller’s focus is poetry, she says she will ensure that students who are interested in other arts will also be involved in whatever is eventually produced. Those with fine-art skills could illustrate a poetry chapbook, for example. The notion of making a living in poetry might raise some eyebrows, but Miller insists that “there are many different ways to have success as a poet,” citing her own history as a writer, teacher and performer. A key aspect of Miller’s project is mentoring. She wants to involve members of Dew More Bmore, which uses art for community organizing and engagement and sponsors a Baltimore City Youth Poetry Team. She hopes to show her students lots of examples of local people who are using their talents to help find their place in the world.